When your clients walk into your law office they can come in with some apprehension. After all, lawyers can be intimidating. Why not relax them a little with the soothing sound and motion of a professional aquarium? Fish are calming. Their fluid motion captivates our curiosity and brings a smile to our faces. Watching their quick directions fascinates us and calms our nerves. We don’t know what it is exactly, but we love to look at them. So why not let the professionals at Michiana Fish Services install one of these rest-assuring wonders in your office. 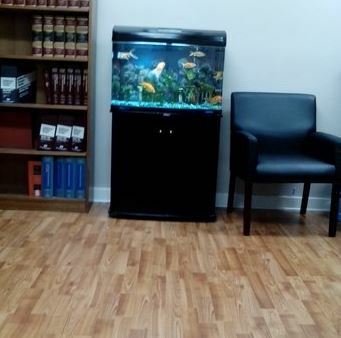 Here at Michiana Fish Services, we provide the right aquarium for your office. Whether it be a small, freshwater tabletop aquarium or an in-wall saltwater one. We have the knowledge and the experts to work with you to get the right equipment that says the right thing about you. For years, we have made it our goal to provide the best service and equipment for all types of homes and offices. We provide services throughout the South Bend area and into Michigan. Our expert Aquarists are constantly learning the latest information and trends in the business. They can help you find the right fish for every aquarium, including compatibility and other tank inhabitants. e are fully insured and provide proof of that upon request. We have earned the honor of being nominated as “Best Pet Service” by the South Bend Tribunes Reader’s Choice submissions for 5 years in a row. We are professional, reliable and timely. We know this matters to you. Customers who have used other services in the past see the difference we make. And since this is the only thing we do, you can have confidence that we will do it right. We know this is a big decision for you so we want to make it simple. Meet with us free of charge to see what we do and allow us to show you what we can do for you. We want you to be completely satisfied with your decision. We offer a 6-month satisfaction guarantee on your decision or we make it right for free. And we have a 7-day live-stock guarantee for fish that we place in your tank. Once you have decided on which aquarium is right for you, we will maintain it, so you never have to worry about adding extra time to care for it. This includes all tank cleaning and inspections with communications on any issues that could arise. We’ll even help with suggestions to brighten up your fish community so it’s never boring or drab. And should something happen, we provide 24/7 emergency service. We even offer vacation feeding services. This helps give you a worry-free addition to your office that you and your clients will love. So let the professionals at Michiana Aquarium Professionals, LLC make your office welcoming and relaxing. Our colorful, little water friends will greet your clients with an assurance that you will do everything you can to make their lives just as simple.